This was a special night. 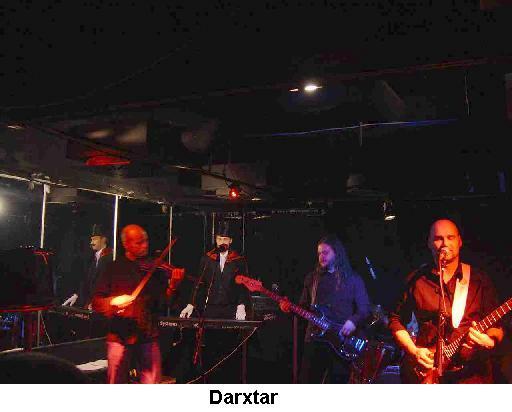 The fantastic Space rock band, Darxtar, have played few gigs in the last years, since I saw them in 1998. This would be their first gig in Finland and only the second or third this year! We met at the club around 4:30 and they guys from Darxtar had just got there as well. It was great to see them again. Only three of the same members but we all recognized each other. It took some time for all the bands to do soundchecks, so we had a lot of time to talk. I eventually went out for some food with Antti (Ex-Wasami) and Sami from Hidria Spacefolk. Everyone was looking forward to the gig and hoping a lot of people would come and they did! About 10:30, the Karma Brothers play Octopus Syng start the show. Octopus Syng is a solo project by a Finnish guy named Jaire. He has released a single and a CD-EP and has a new CD out any day now, in which he writes all the songs and plays all the instruments. This was the first gig playing his music live. He was backed by pretty young musicians. 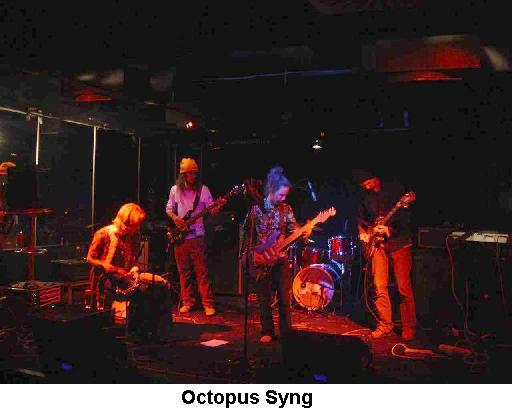 The music of Octopus Syng is deeply rooted in the 60’s with Syd Barrett being an obvious influence. The band played a fantastic set of weird ballads and soft grooves and psychedelic jams. 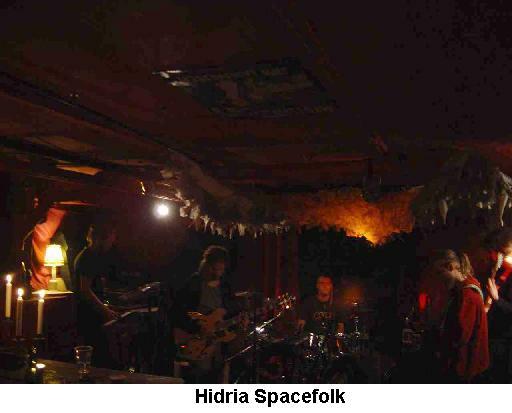 The bass player had major technical problems and his bass had to be discarded and he used the one from Hidria Spacefolk. Really excellent bass lines and strange guitars. I was most surprised by the set of diverse psychedelic rock. I hope that they play more gigs! Hidria Spacefolk were pretty fast to get going and you could tell the crowd was mostly here to see them as it was packed up in the front of the stage. This would be a special gig as one of the two lead guitar players was stuck in Denmark and could not make the gig. They had a guest guitarist, Heikki from Uzva on all but the first song. LoQ opened the show with really spacey synths that everythings slowly built up upon as they launch into "Dimi". They really had a great groove tonight and the crowd was really into it. Guitars were a bit low in the mix for my taste. Next up was "Kifi" and the new song that has a Steve Hillage like riff, and is therefore called "Steve". Every song was 10 minutes or more and intense grooves! These first three will all be on the new CD they are recording in November 2003. "Kaneh Bosm" from the Symbiosis CD was really great. "Kaikados" also from Symbiosis ended the set and they were joined by an unknown person telling stories or such. Strange but ok. Cool set. They wanted to play "I-Mantra" but there was no time as it was getting late. Now, Darxtar take the stage about 1:15 and open with two songs from Tombola, "Silently Driftin’" and "Blue Frozen Flame". These songs come across well live. It was great to have Fredrik playing the violin and the two new synthesizer players, Charlie and Mandrake, the later being dressed up like a magician (it was Halloween!). Patric on the drums and Marcus on the bass are long time Darxtar members although they have played and do play in other bands as well like Psuedo Sun and Last Laugh. Anyway, a new song called "Secrets" followed. The real space rock began with "Warriors" spoken word into "Voices of my Dreams" and "Dark Daze" from the Daybreak CD. This was fantastic to see and hear. The synths were a bit low in the mix and Charlie later complained he could hear nothing that he was playing! I was hoping for "Breath Messages" or "Compromised Space" to be played but they were not. Next were three more new songs. The title track of the bands fourth CD, Sju ("7") was played next. Another new song and quite a heavy one called "It All Happens Here" closed the set. The band did not leave the stage and played the excellent "Tombola" with a great violin solo by Fredrik. What a fantastic night of music and it was so great to see and hear that Darxtar lives and breaths in the live setting. Lets hope for more gigs by this talented band in 2004!